It is said that one will come across an Indian in any part of the world so rest assured if you ever get invited to their home, you will be served some form of Indian cuisine. Where ever they may be living, Indians do become very nostalgic about their own country India, especially during Independence day. Today while I was cooking, I got to listen to a lot of patriotic songs on our local hindi station and was really amazed at the talent India has. I know of many Indians born and brought up outside India and do not have a strong connection with India. However our story is different. My husband studied in Manipal and Mangalore, I did my secondary education in Mt. Abu and my children too completed their IB in Kodaikanal. So yes, we all do have a very strong love hate relationship with India. When ever we visit India, we love the food, shopping, entertainment, people etc. After a few days the rubbish around, the traffic, the sheer number of people and smell get to us (not that Mombasa is any different these days ! ).When we land back home a deep breath of fresh air is so welcoming but after a few days we begin to miss India again. For me it has always been home away from home. I love India and would love to visit it as often as possible. So wishing everyone a very happy Independence Day and hope you love my simple tiranga halwa recipe. Quick and simple to follow. Leave all three mixtures different, set it in layers in a tray or like me roll it into multi coloured balls. Mix carrot, sugar, khoya and ghee in a pan and put it over medium to low heat. Stir constantly. The mixture will become watery and then begin to thicken. After about 5 minutes the mixture will begin to come away from the sides of the pan and it will be dry. Remove the halwa from the pan into a plate or bowl. Mix in the cardamom powder and saffron. Let the mixture become cool. Mix coconut, sugar, khoya and ghee in a pan and put it over medium to low heat. Stir constantly for 5 minutes. The mixture will become a bit dry. Remove the halwa into a plate or bowl. Add the cardamom powder and mix well. Let this halwa cool down a bit. Mix doodhi, sugar, khoya and ghee in a pan and put it over medium to low heat. Stir constantly. The mixture will become watery and then begin to thicken. Remove the halwa from the pan into a plate or bowl. Mix in the cardamom powder and pistachio powder. If you want to make a layered halwa, lightly grease a tray with ghee. 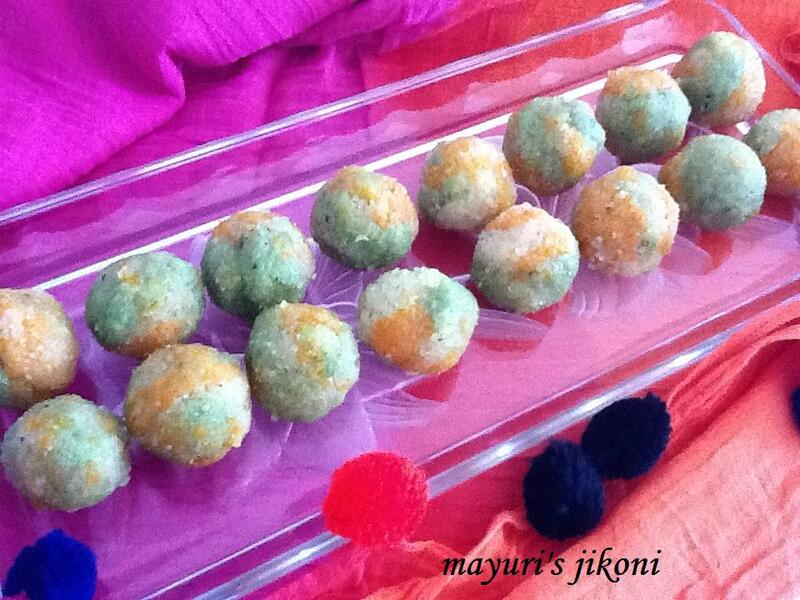 Layer the green one first followed by the coconut one and top it with the carrot halwa. To make multi coloured balls, take a bit of all three and roll it gently into a ball about the size of a walnut. Decorate the top as you like with chopped nuts or edible silver foil. Grating the coconut, carrot and doodhi finely helps to cook it faster. Add nuts of your choice to the halwas. If you do not have khoya or mawa, use powdered milk or condensed milk instead. If you are using the sweetened condensed milk, reduce the amount of sugar. Serve any of the halwas (warm) with ice cream as a dessert. perfect for Independence day… Thanks for linking it to my event!! Looking for more yummy recipes! !